An enterprise resource planning system is essential for increasing growth and efficiency in today’s marketplace. Sage is a leader in ERP packages that can help your business integrate operations, collect and use data, plus stay current, backed-up, and secure in the cloud. Adopting and tailoring a Sage solution that suits your parameters can be streamlined and set-up right from the start with the help of knowledgeable consultants. IWI Consulting Group assists small- to medium-sized businesses and non-profits with adopting enterprise resource planning, customer relationship management, and human resources management systems and customizing them to meet unique needs. We specialize in Sage 300 Cloud support in Toronto and in onboarding a variety of other Sage financial management and enterprise management software packages, with training, resources, and ongoing assistance when you need it. An ERP system can do a lot for your operations and management. A suite of programs like Sage Business Cloud has multiple solutions to choose from, like Sage Intacct, Sage Enterprise Management (formerly known as Sage X3), Sage People, and Sage Live. If you’re working in the retail industry, manufacturing, in the non-profit sector, food processing, or dealing with financials, your specific needs are going to differ. Our consultants can assist with making a Sage product or package work for you from the first moment it’s implemented, so you can focus on running your company and its daily operations. Your teams can have up-to-the-second access to the same information and reports. Our IT professionals can assist with network help and get a slow network running smoothly again. A dependable connection is critical for your business and our highly experienced and skilled technicians can help with designing, implementing, securing, and providing ongoing support. We specialize in VPN, remote access, firewall setup, and routing, plus requirement consultation and performance improvement. Move from your ageing, antiquated, and buggy system for accounting and management to a new Sage ERP solution and gain a 360-degree view of data and financials you need to optimize your business, increase productivity, and cut costs. We can help you make the switch by assisting with product migration from disconnected silo systems like Excel, or even paper filing systems, to a revolutionary program in the cloud. Your business has unique needs that older, standardized products were failing to meet. 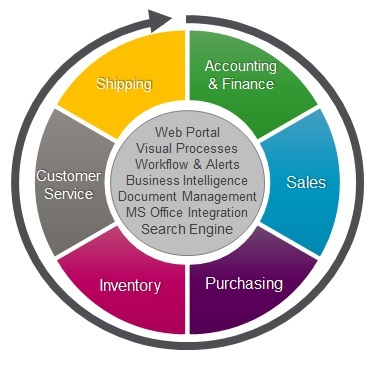 Sage ERP systems tend to satisfy at least 80-90% of these needs straight out-of-the-box. Our consultants can provide customization to fill in the gaps. We also build to accommodate future needs to keep your costs at a minimum. Once you’re on board with a Sage solution and support from our consultants, we provide helpful demos and webinars to provide ongoing training resources to assist your teams, which are easy to access from our website. Our Sage 300 Cloud consultants in Toronto and customer support team are happy to assist you with any inquiries. IWI Consulting Group’s success is based on understanding your needs and answering them. Our promise is to deliver the best ERP consulting services available in the GTA. Our expertise and industry knowledge combined with our technology know-how gives us a competitive edge that you can benefit from and rely on.